In honor of this Sunday’s upcoming book signing, it seemed like a good time to post an excerpt from Where the Water Rages. If you’ve been on the fence about reading it, here’s your chance to check out a portion of the book and see if it piques your interest. The following excerpt from Chapter 10 takes place at the Bhuping Palace in Chiang Mai, where Kimly Denim, an American journalist is meeting with SuSuk, the head of a prostitution ring, a man with ties throughout the Southeast continent. Her surroundings were mesmerizing. The ferns were enormous and the trees had thick vines falling to the ground. Some of the vines had fallen, landing onto another tree, and the two had grafted together. The walkway narrowed in places and the ferns brushed softly against her arm. After climbing about thirty steps, Kimly saw a man waiting for her. Kimly opened her mouth to speak, but nothing emerged. His neck. The tattoos. It was him, the man from the bathroom at Walking Street. She didn’t have to obey, did she? She stopped. As she gazed straight ahead, the most brilliant bush of purple asters caught her attention. The sharp pointed petals pierced the green fern it neighbored. The fern submitted to the radiant beauty of the aster. She looked back at the man with the tattoos, pulled her chin up and held his gaze. Tattoo Man nodded his head up towards the stairs, clearly indicating she should continue climbing the steps. Is he going to follow me? She turned and moved upward, the sound of her heart pounding growing louder with each step. She had taken about seven steps when she turned and glanced over her shoulder. Tattoo Man hadn’t moved to follow her. So, you’re not him? She continued her climb. Reality snapped into focus. She knew there would be many people, many men, involved in this underground business. She reminded herself that to these men–this was just a business. Just like any large corporation, there are underlings and there is a CEO. Am I meeting the CEO, or is this SuSuk below someone else? Taking a deep breath, Kimly moved forward to the edge of the bench. The man was wearing a gray suit and a black and gray striped tie. The suit jacket was unbuttoned, and his shirt had a reflective luster. He sat, one leg crossed over the other, and dangled his foot. When he pulled his cigarette up to his lips, she noticed the gold cufflinks attached to his pale pink shirt. He wore rimless glasses with a gold bridge. His oily complexion was smooth, and his thin eyebrows pointed down towards his eyelids. He had almost nailed the appearance of the wealthy and successful Asian businessman, one who would be holding a meeting with clients in a Bangkok sky rise. Everything was almost perfect. Almost. His black dress shoes were unpolished and slightly scuffed, and they didn’t blend with the image he was trying to portray. She wasn’t sure how she should greet him. Her heart was pounding. If this man was to believe she was just another client she couldn’t act fearful, she needed to appear desensitized to their arrangement. As she got closer, she cleared her throat to speak. “Come and sit. We have to discuss a few things,” he motioned her to the edge of the stone bench. Kimly drew in a deep breath and moved closer to the bench. “Go ahead. How does this work,” being near him was repulsive, so she decided whatever he said at this point, she would simply agree. If he asked for more money, she would agree and then leave with her life. “How did you find me?” he took a drag from his cigarette. “No,” he did not turn to look at her. “How did you find me?” He gazed across the grounds of the palace. “You told us to come here. Early this morning, on the bridge,” she squinted her eyes. Kimly turned her head away and looked out across the palace grounds. In the distance, she saw an expansive building resembling a ski lodge. The white building sported a twenty-foot orange tile roof which shot at an 80degree angle toward the sky. There were several pillars across the front of the building protecting the ample porch. Was that the palace? She expected it to look more “palace-y.” Perhaps her notions of royalty were completely off. Did corrupt underworld figures have access to influence in the Royal Family? “I bought a box from a vendor on Walking Street. It contained the name of the bridge,” Kimly tried again to answer the business man’s question. The strangely dignified man, who Kimly determined was, in fact, SuSuk, inhaled long on his cigarette. He still hadn’t turned to look at her. He exhaled. She waited. She had moved her boat into his port, given him the answers he sought; it was up to him to navigate the waters. “I once tried to own a dog,” SuSuk looked at his cigarette, but still not once at Kimly, “I find him outside my house, so I decide I will feed him.” He took a long drag from his cigarette and then flicked it forward. It flew over the ridge and disappeared in the greenery. A ring on his hand sparkled in the sun, which was just above eye level. Kimly swallowed hard and then breathed deeply. “I could have killed him, but what would he learn?” He didn’t continue. He sat staring straight ahead. Is he waiting for me to answer? Kimly’s mind swam. Kimly’s mind was spinning. How could I have been so stupid? Answers were a million miles away. This should have been a simple answer, and she couldn’t conjure up anything in response. “You know what I think? I think you are looking for more than you should be looking for. I think you are trying to steal something from me. I don’t like it when someone steals from me. What’s mine is mine,” and with that said, SuSuk turned and looked for the first time into Kimly’s brown eyes. Kimly stood, and SuSuk grabbed her wrist. “I’m not finished.” He stood and began to lead her back toward the path. Dak couldn’t help her from the bottom of the steps. If he came running up the steps he would meet the tattooed underling half way up…then what? The thought of Dak getting hurt kept her from reaching into her pocket for her phone. She needed to get away. SuSuk’s strength was greater than hers. Kimly held tight to the hanging vine and it dug into her palm until she released it and continued stumbling through the mock jungle with him. He pulled her around the corner of a small white cinder block building and pushed her against the wall. With his right hand, he tightened his grip on her wrist. She pulled away from him trying to maneuver her body and gain control, but he used the forearm from his left arm to push her neck against the blocks. His gold cufflink cut into her jaw line. She heard it. She had heard this voice before, and she had not recognized it, but this time she knew. It was God. It was the God with a plan, Dak’s God. When Dak had prayed in the Jeep it was more than just hopeful words, God had heard Dak’s prayers and He had come with them to the palace grounds. She closed her eyes and tried to think of the words to plead with the God with a plan to help her. “Open your eyes, you stupid woman. Look at me.” Kimly didn’t raise her eyes to his. She was afraid the evil would overcome any bit of confidence she might muster. She continued to search for the words a person might use to plead with God for protection. She didn’t know how to pray, so she simply began a silent uttering of phrases she remembered Dak praying in the Jeep. Forgive me for doubting. Surround me. Change the hearts. Please move…please. She could only remember pieces of what she had heard Dak pray, so she just kept repeating them. Interested in reading more? 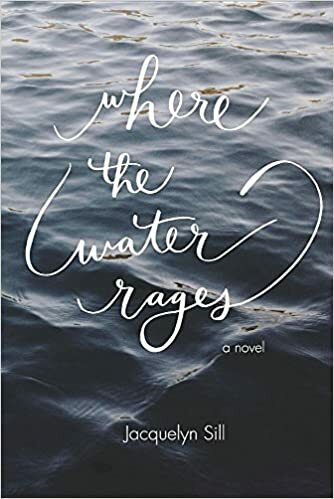 Find Where the Water Rages on Amazon! Available in Paperback or on Kindle – CLICK HERE to Order your copy today!